Home > Planning Your Speech > Length of Speech? Does this scenario sound familiar? It’s every speech maker’s nightmare. Not only can’t this employee get a straight answer, but he or she is left having to interpret whether “a little bit” means two minutes or half an hour. Is your audience a squirming group of five-year-olds? Or is it a crowd of laid-back fifty-year-olds? Will you be talking to folks who have already had to sit for hours listening to other speech makers, or will you be the only public speaker at the event?Depending upon your listeners, you’ll want to adjust the length of your talk to fit what you believe they need and expect. On the other hand, if you’re expected to give a lecture on the history of Renaissance painters and their unique styles of teaching apprentices, you probably won’t be able to (nor would you want to) abbreviate your topic. 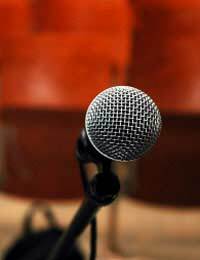 Are you one of many public speakers at the event in which you’re giving a talk? Or are you the “keynote”? Your role (and you should be aware of this before the occasion) will absolutely guide expectations as to length of your speech. For example, if you’re expected to give the single eulogy at a memorial service, it should be appropriately long. But if you’re one of many people eulogizing a deceased individual, you’ll need to pay attention to your timing and keep your comments positive and brief. Is what you have to say potentially going to be received with hostility? Or will the crowd be pleased with what you have to tell them? Sometimes, the mood of the speech can determine the length, especially if you have “bad” news to tell listeners (or if you’re giving a talk to the media). Obviously, brevity is best when the subject matter is expected to generate some level of negativity, whereas you can speak for longer periods about a pleasant theme. If your audience is expecting to have the opportunity to ask questions of you, it may be necessary to shorten the overall length of your speech to make room for their queries. Otherwise, they won’t be satisfied with the outcome of the event. Alternatively, if you’re being asked to give a straightforward lecture to an audience, a question and answer session could appear out of place. Without a doubt, it’s best to get as many details on your speech as you can before you step up in front of a crowd. That being said, if you’re forced to determine the length of your speech on your own, rest assured that you can make a wise decision based on what you DO know about the event.